Let’s start by examining the world of marketing! What is it, what does it consist of, and how are the different components used? Marketing Explained helps you to grasp the whole context and content of marketing. 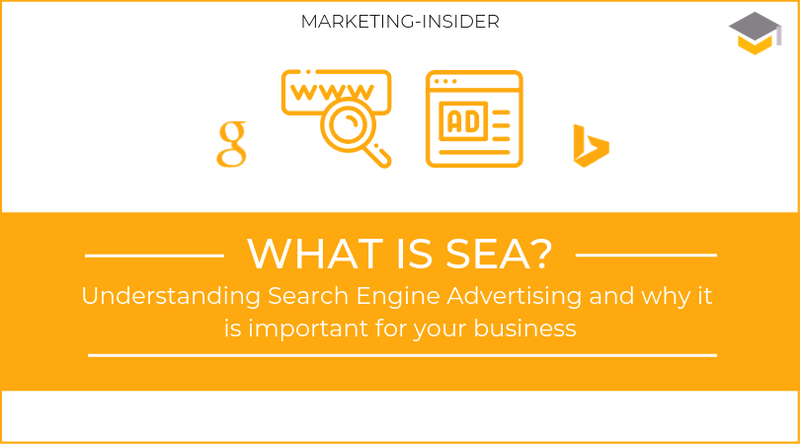 SEA is an important channel in online marketing. The term stands for “Search Engine Advertising” and refers to all paid elements on the “SERPs”, i.e. the search engine result pages. The aim of this type of advertising is to place advertisements for relevant keywords prominently on the SERPs and thus address users who are interested in the products or services offered by a company. All major search engines have their own services through which ads can be placed. Google offers “Google Ads” and Bing “Bing Ads”. To differentiate: SEO (Search Engine Optimization) serves to optimize organic rankings, while SEA refers to the placement of paid search ads. Both areas together form SEM (Search Engine Marketing). I’m sure you’ve seen this before: You google a brand and above the organic search result, you see an ad for a website that picks up your keyword. This has several advantages: Firstly, ads that appear on the first page or above search results receive significantly more clicks than ads on subsequent pages. With SEA, you can set the ads to appear on the first search results page or even before the first organic search results. Secondly, you can precisely define your target group with the help of demographic and geographical characteristics. Another good reason for search engine advertising is that it has a positive effect on the organic ranking of a website. A successful campaign will attract more visitors to your website who are actually interested in your products or services. This will give your website improved relevance to users and thus increased chances of reaching a high position in the search results. Successful branding can also increase direct traffic to your website: Users remember your company when searching and go directly to your website. The principle behind search engine advertising is basically quite simple: An advertiser defines keywords, creates associated text ads and indicates how much a click on his website is worth to him. The basics are easy to learn. However, to advertise effectively, it is advisable to go into depth. Let’s start with the keywords. Firstly, there are keywords that correspond exactly to the search query. For example, advertising for the matching keyword “cheap flights” is only placed if a user enters exactly this search term into the search engine. Next, there are phrases that contain keywords. Here, ads are only placed for terms that contain the previously defined keyword, but which may have been supplemented by another term. For example, as with “cheap flights from Berlin”. Synonyms come in third place. Here the advertisement also appears with synonyms of the actual key term. To make sure that certain terms are not used for advertising purposes under any circumstances, you can enter negative keywords. Ads consist of three components: the title, the URL, and the description. For a successful campaign, the title should contain the main keyword. The URL must be as accurate and short as possible. For the description, you should adhere to the specifications of the search engine. If the text exceeds a certain length, it will no longer be displayed. So keep it as short as possible. Where and how often an ad appears in search engine results depends on several factors. Google AdWords, for example, is auctioning off the ad slots for each keyword. The winner is not necessarily the one who offers the highest price, but the one who can deliver the most appropriate website for the desired keyword. Google determines a “quality factor” of the bidding websites. The network examines how relevant a website is for the keyword, and how users have responded to the website in the past. Did the user leave the domain after one click without further action (high bounce rate)? Have the users stayed on the page for a long time (long residence time)? Or has a website even led the user to a conversion? Google rates the page based on these factors, with a value between 1 (irrelevant for this keyword) and 10 (most relevant to this keyword). In addition, the network gives the bidders a price recommendation for the desired keywords based on empirical values. In the past, highly competitive keywords are usually more expensive than less competitive ones. Advertisers bid based on this recommendation. Google will then multiply that bid by the “Quality Score” to determine the winner of the auction. With Google or Bing Ads you have the possibility to manage your ads. In your account, you can specify the name of the campaign, the duration of the campaign, and your total budget. For each ad, you should define the keywords and specify which page a user will land on when they click on your ad. During your campaign you can always add, edit or remove keywords. Google even gives you the opportunity to forecast your keyword performance based on similar campaigns. So checking your campaign once in a while is definitely worth your time. What are the effects of successful SEA? Now that we have clarified how it works, we come to the reasons why all the extra work is worth it. The effect of paid advertising should not be underestimated. For instance, repeated confrontation with a brand name alone has a positive effect on the advertiser — even if the user does not click on the ad. The ads create familiarity with the brand name, which in itself can lead to a more positive perception by the customer. This is referred to as the “Mere Exposure Effect”. In various psychological experiments, it was shown that random patterns were rated more positively by the test persons the more frequently they saw them. Many people are familiar with this effect from popular songs: When listening to a new song for the first time, they may not like it, but every time the song is played on the radio, they are a little more attached to it. The same applies to advertisements. When users are more aware of the content of a website through advertisements, this has a positive effect on the organic clicks. Most Important Consumer Product Characteristics – What defines a Consumer Product? In order to provide value to consumers, it is important to first understand the key consumer product characteristics. What defines a consumer product? Cutting Edge Marketing Automation Tools – How to automate Marketing ? Marketing has become 24/7/365, especially with Social Media websites. Consumers want more frequent, relevant and personalized content. Learn how the latest marketing automation tools can be used to keep your customers happy. Key Marketing Strategies for Startups – How to kickstart your business? The Consumer Acquisition Process – How do Consumers decide?